A passport is a very important document if you are travelling abroad. A mark of your identity and nationality, one just cannot afford to misplace a passport. 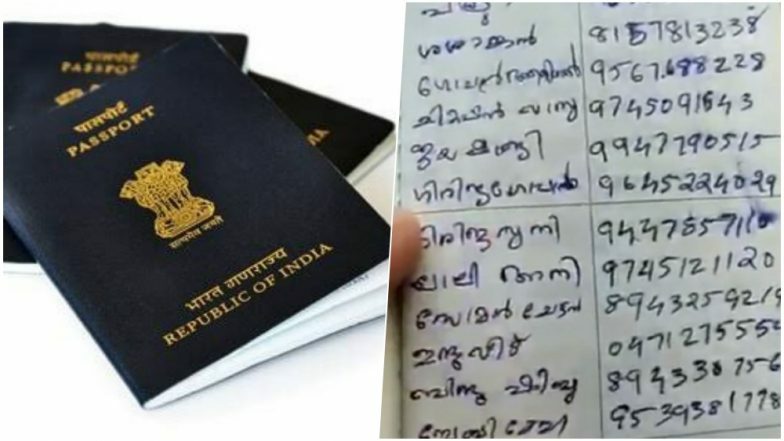 But a woman in Kerala used her husband's old passport as a phone directory. And that's not all, on the few last pages of it she has jotted down her grocery list and some calculations. In the time when most people depend on their phones for saving numbers and taking notes, this woman still preferred being traditional and chose a very important document for it. A video of this makeshift phone directory is going viral on the internet. New Visa Rules for Indian Passport Holders Makes International Travel Lot Easier to These Countries! While most people use their phone contacts to save all numbers, the elderly generation still prefers a phone directory. The video shows the old passport being turned into a phone directory. If the numbers weren't enough, it was used to list down grocery items as well. We are not sure how the husband would have reacted on finding out. The video is being forwarded and shared on social media. People have called it jugaad, the typical Indian way of innovation. Several users are left laughing on it, with funny interpretation and comments. One of the comments read, "Another way of tattooing passport." Well, clearly a new way of getting stamped, but definitely not a wise one. An old passport is just as important as the new one. A passport is a valid piece of document that marks one's citizenship and it should not be tampered with. It is widely accepted as one's proof of identity. It is also very important to get a renewed passport.